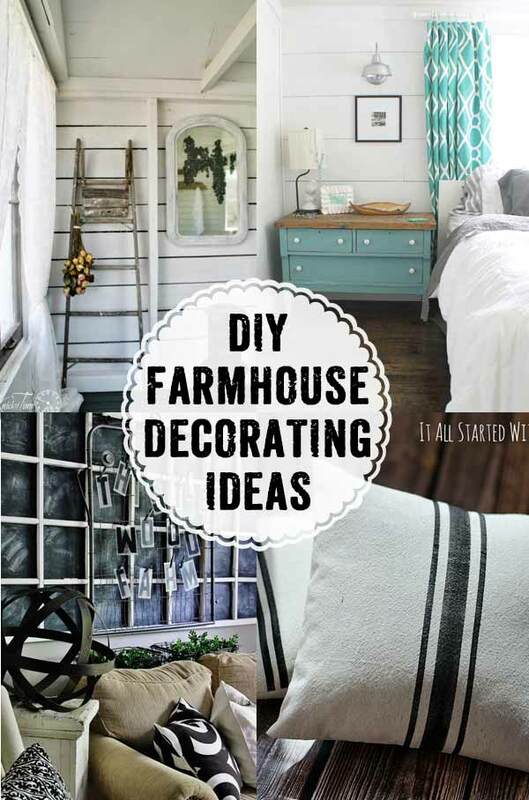 Love farmhouse style decorating ideas? Me, too! So today’s post is all about getting the worn, warm, feeling of a farmhouse – on a budget of course. And because we all love to DIY – all of these decorating ideas are all about brining the look into your home on a budget. Unless you’re lucky enough to live in an older home, you probably wish you had more of the farmhouse feel to the house itself. This is where adding architectural interest comes in. With a few easy DIY projects, you’re well on your way to turning a boring space into a fresh farmhouse style room. Start with shiplap. It’s pretty easy and inexpensive to add a shiplap accent wall in just a few hours and it goes a long way to turning a space into a farmhouse dream room on a budget. Add magic with molding. 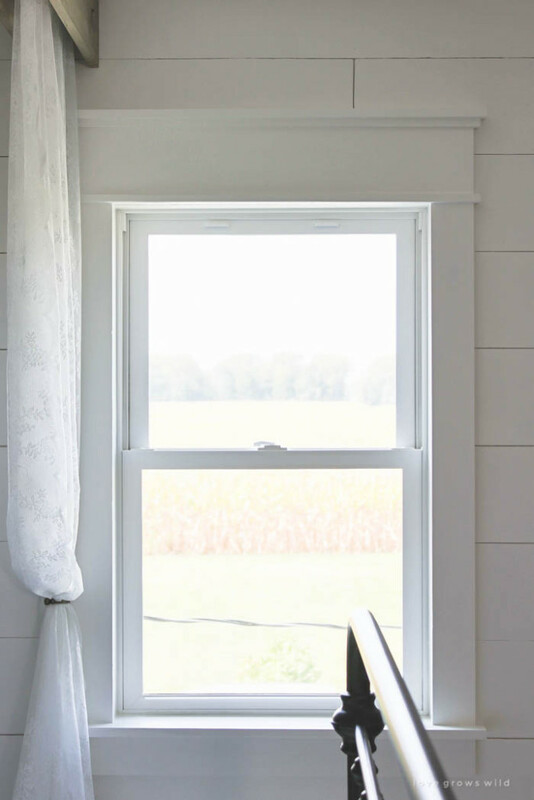 It’s amazing how just a couple of hours and some basic lumber can bring any window to life like Liz did with her farmhouse window trim. Farmhouse flooring. And yes, you can DIY it, too! Our floors are over five years old and still going strong. 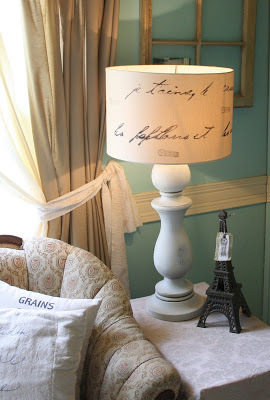 Repurposing items to give them a new life is one of my absolute favorite things about decorating. It can add an unexpected twist, one that brings in a bit of quirk – but also some personality. Because bringing outdoor pieces that work on the farm can work inside the home, too. Let ladders lend a hand. What’s more farmhouse style than a ladder that was probably used to pick apples or peaches at some point? Angie added this one to her guest house as a beautiful accent piece. Work with a washtub. I’ve seen washtubs used for tons of things inside a home, but this light might be my favorite yet. 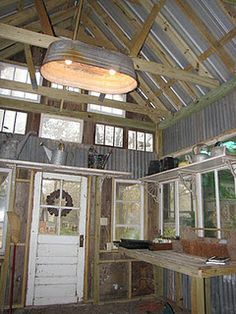 I think it would look best outdoors, but a house with super high ceilings might be able to pull it off, too. Curbside finds are perfect for the farmhouse style, because the imperfections only makes them look even better. 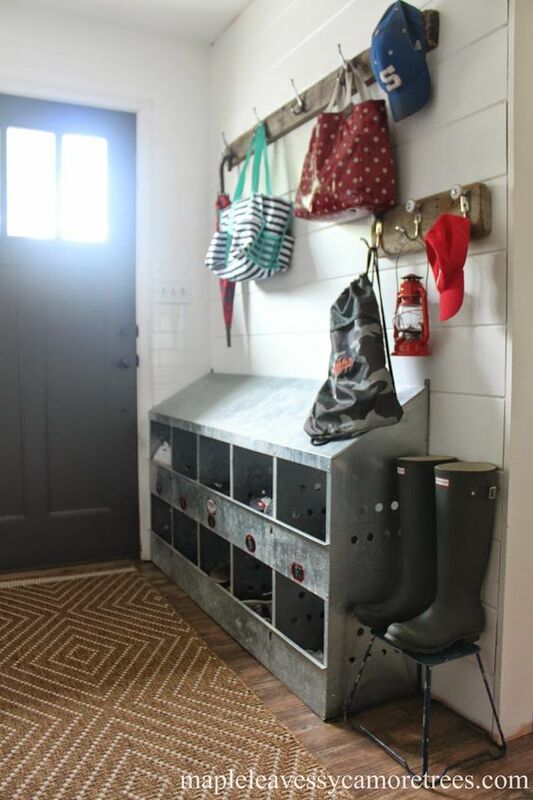 So slow down next time you see that trash and turn it into treasure like these great ideas! Make a note. 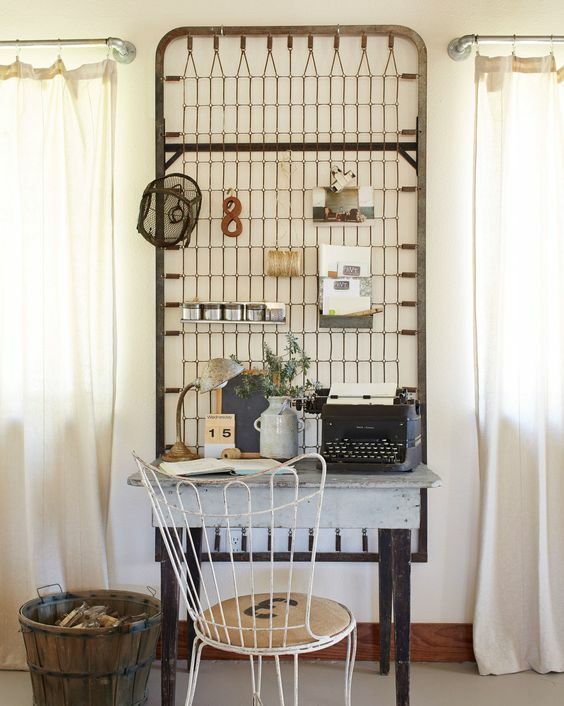 A simple set of springs from an old bed frame makes the perfect farmhouse style memo board. Save a spool. 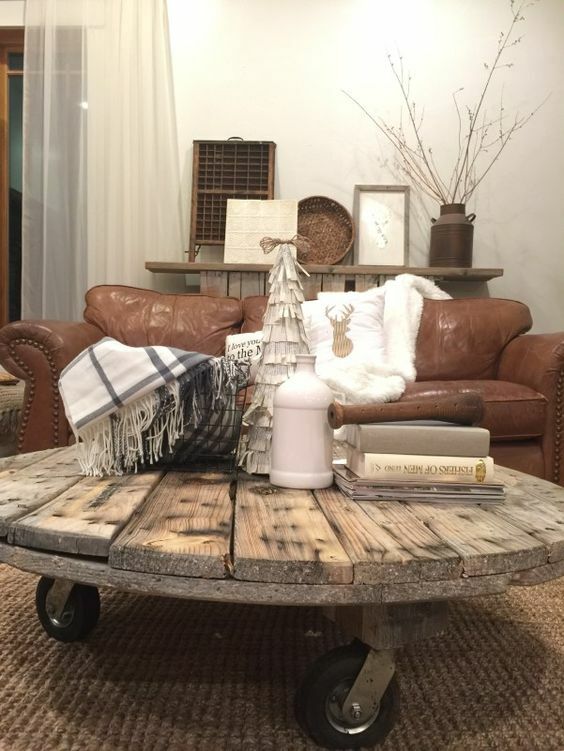 Sara was lucky enough for her kids to bring her home an old cable spool, and she turned it into this beautiful farmhouse style coffee table. Create a chalkboard. 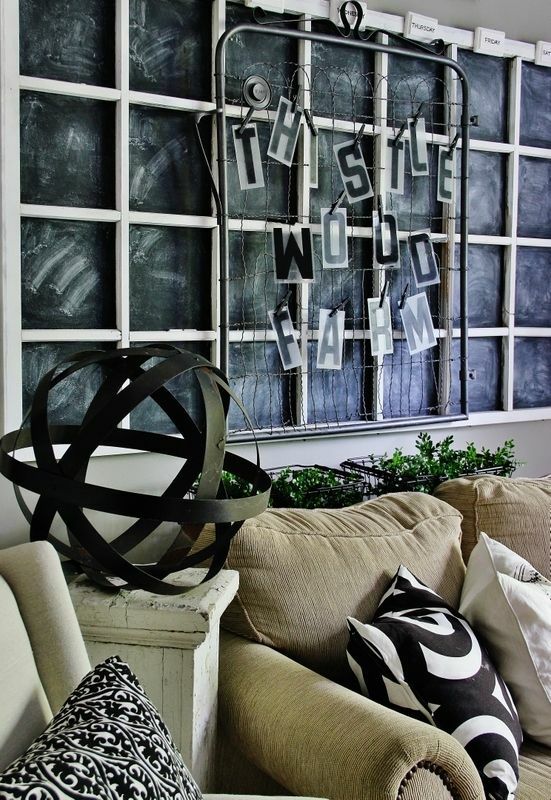 I think there’s a rule written down somewhere that every farmhouse style home has to have a chalkboard. Karianne must have had the junk angels on her side when she found this gorgeous window in the trash that she turned into a calendar chalkboard. Don’t want to buy/make something new. Just paint a piece you already have! Paint is such a cheap way to get a whole new look for just a few bucks, and these farmhouse style paint tutorials make it even more Fixer Upper. Work with whitewash. 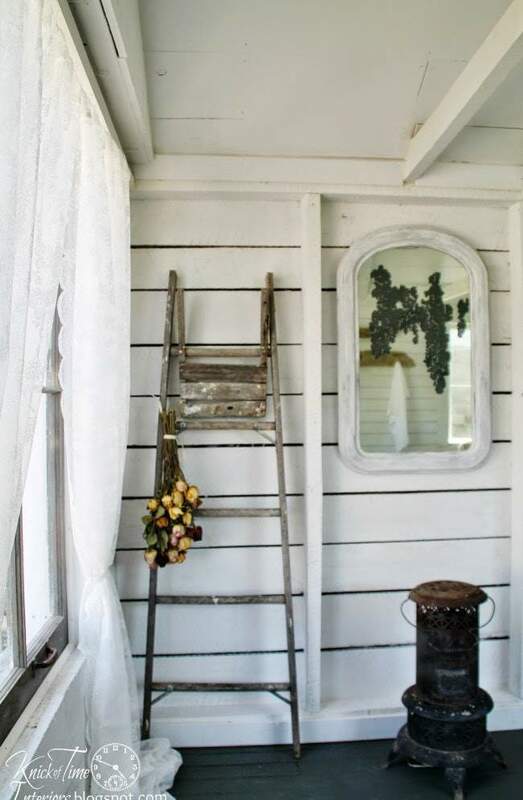 The farmhouse feel has always been enhanced with a little whitewashed wood. 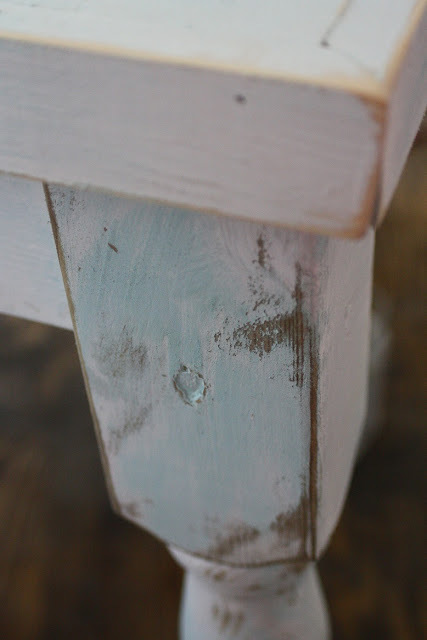 Want to learn the classic technique to get the barn wood look? Shannon has a great tutorial for that. Create a chippy look. 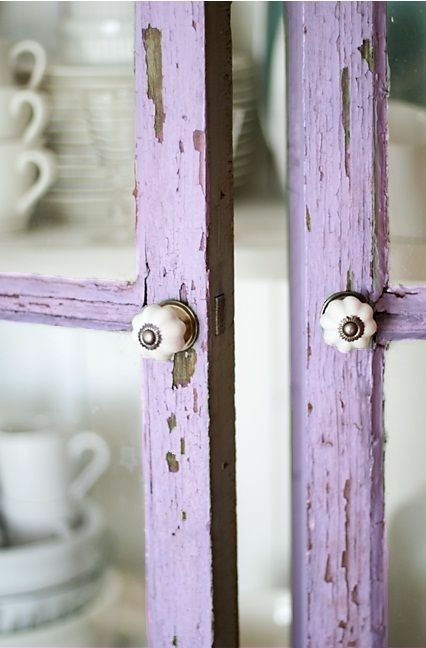 Don’t wait 20 years for paint to get the worn patina on it’s on – especially when you can get the look fairly easily. Isn’t this finish gorgeous? Double up the color. 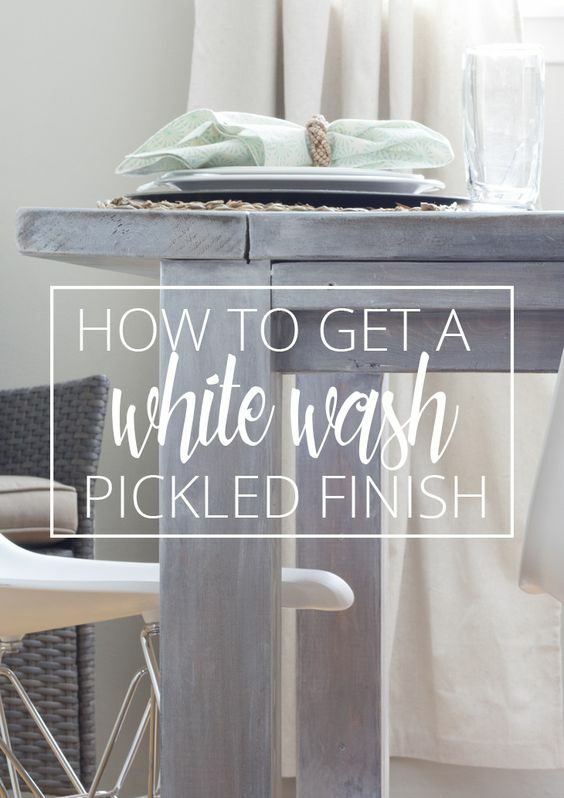 Layers of different color can add a fun twist to a piece of furniture, and this shabby farmhouse style paint technique is a super fast way to get the look. Want just a hint of farmhouse style without going overboard? Just add accessories! 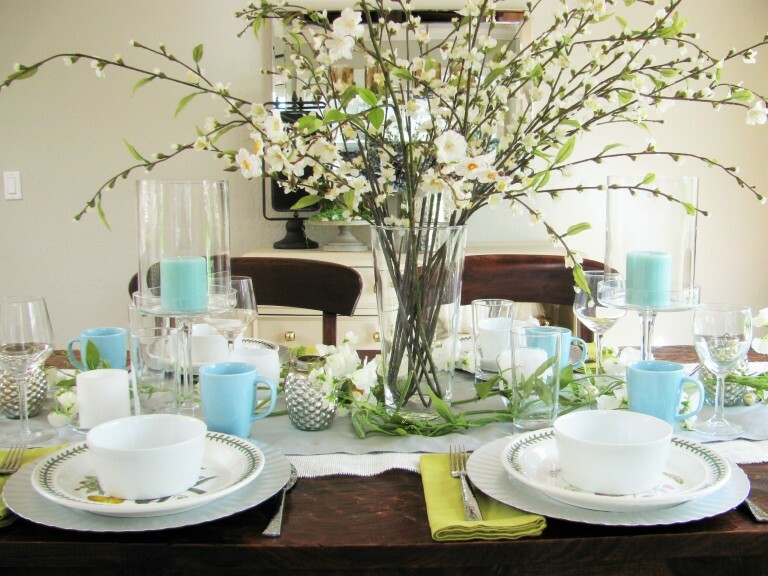 These easy DIY ideas are quick to make and go with almost any style. Light ’em up, up, up! There’s a million and one ways to create a little farmhouse lighting, but this lamp got a whole new look with just a little paint. Grain sack for the win! Because nothing says farmhouse style more than grain sack. 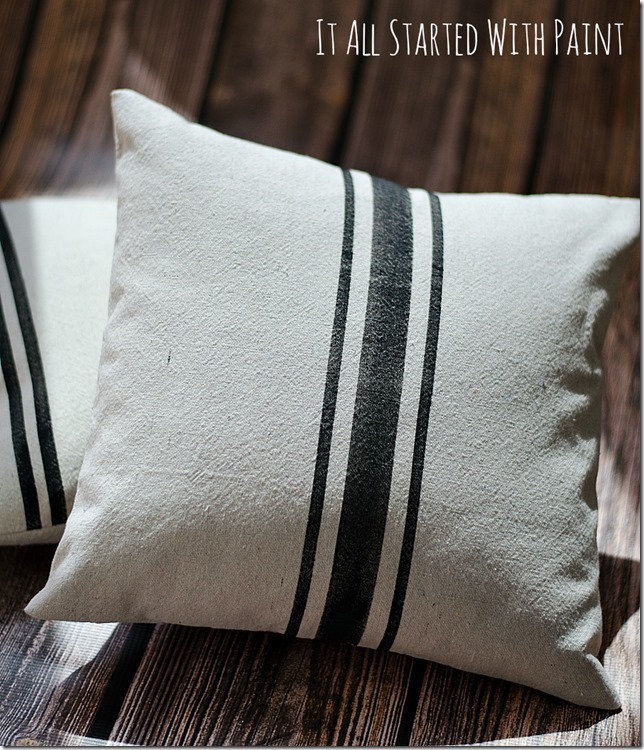 These pretty drop cloth pillows are such a great accessory. Because, burlap. No self-respecting farmhouse would be complete without at least a little burlap. Want just a hint without going overboard? A DIY burlap table runner is the perfect way to go. Want more farmhouse style inspiration? I love your blog. I only started following a couple of weeks ago. I look forward to receiving in my inbox all of your posts. Love them! Love love love these pics. 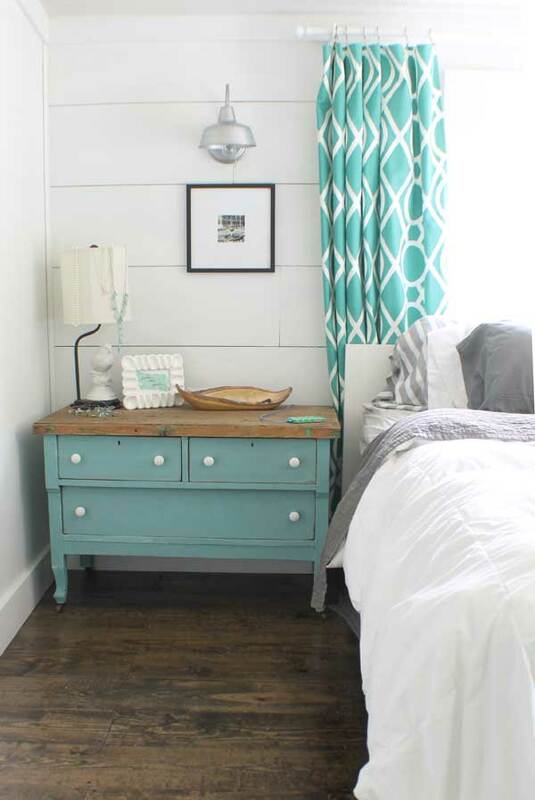 Do you happen to have the name of the paint color on the dresser in the first bedroom photo? Thanks Karen, you’ll do great!! I was looking for your method of planking your wall. 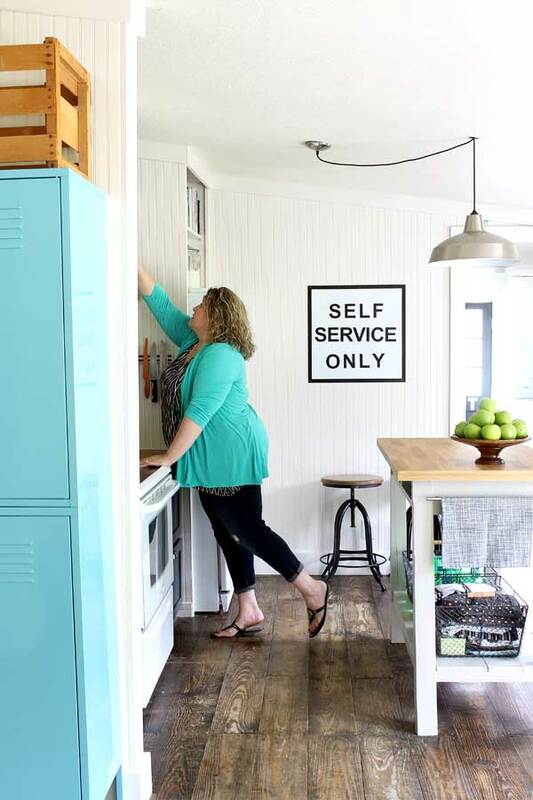 I am thinking of doing an inexpensive (cheap) white shiplap look backsplash… help! P.S. Love your home and your decor! Thanks so much and go for it Karen!! Thanks so much Crystal, good luck! !